Giorgi Margvelashvili (Georgian Dream-Democratic Georgia), former Education and Science Minister and candidate of the party in power was elected as president of the Republic of Georgia in the first round of voting with 62.12% of the vote. He pulled ahead of the former leader of Parliament (2008-2012 Davit Bakradze (United National Movement ENM) who won 21.72% of the vote. Nino Burjanadze, leader of the Democratic Movement-United Georgia came third with 10.18% of the vote. The election result was expected - the only issue at stake being the candidate's election in the first round or not. Turnout totalled 46.6% i.e. 17.87 points less in comparison with the previous presidential election on 5th January 2008. The election was monitored by 55 foreign and 57 local organisations. "It is our joint victory. I want to thank all of those who supported me. Thank you to the Prime Minister who helped me win," declared Giorgi Margvelashvili when the first results were announced. "I congratulate Giorgi Margvelashvili on his victory and the confidence granted to him by the Georgian people," stressed Davit Bakradze as he acknowledged defeat. "This shows that we are real Europeans. People can choose freely," indicated Prime Minister Bidzina Ivanishvili (Georgian Dream-Democratic Georgia). "Support to the head of government helped the new head of state, who is not known to the general public, to gain in popularity," highlighted Alex Rondeli, chairman of the Georgian Foundation for International Strategic Studies. "The importance of the presidential election on 27th October is relatively low: whoever the winner, it is the Bidzina Ivanishvili coalition which will continue to govern," declared Koba Tourmanidze of the Caucasus Research Centre. Indeed the constitutional reform of 2010 deprives the new president of some of the powers held by his predecessor to the benefit of the Prime Minister and parliament (Sakartvelos Parlamenti). The head of state can no longer form or dissolve the government without parliament's consent. Bidzina Ivanishvili announced that he would leave office on 24th November next. "I do not intend to lead Georgia into the shadows," he said adding, "my programmed withdrawal from politics will help to attract investments." He promised to pay Georgia $1 billion from his personal fortune (which was the 153rd biggest in the world in 2012 according to the American magazine Forbes and is estimated at 5.3 billion $ i.e. one third of the country's GDP). More important than the choice of President will be that of the Prime Minister. 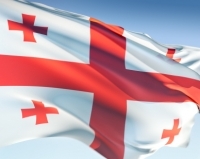 Three people have been pre-selected to take over from Bidzina Ivanishvili: Interior Minister Irakli Garibashvili, Defence Minister and also leader of the party Our Georgia-Free Democrats Irakli Alasania, and finally Deputy Prime Minister Kakha Kaladze, former captain of the national football team, who is the favourite. Bidzina Ivanishvili said in September that he would choose his successor himself. His resignation, which 70% of his fellow countrymen oppose, according to a poll by the American Democratic Institute (NDI) does not mean that he will be retiring from political life. According to the Prime Minister the ENM should disappear rapidly. Moreover without any other opposition the coalition, Georgian Dream should divide until a "new multiparty system emerges in the country." "Bidzina Ivanishvili will remain a key person in Georgia whilst leaving the country's daily management to the Prime Minister of his choice. He might have an appeasing influence over the next few months but long term it will not serve the interests of Georgian democracy," declared Lilit Gevorgian, an analyst at HIS Global Insight. "When Mikheil Saakashvili is no longer President of the Republic the situation will change and the government will no longer need my help," indicated Bidzina Ivanishvili. The Prime Minister qualified the outgoing head of State a "political corpse" "Mikheil Saakashvili will no longer be able to undertake a political career in Georgia," he added. The outgoing president might be questioned by the authorities when his mandate ends notably regarding the death of former Prime Minister (2004-2005) Zurab Zhvania and also about the repression of the demonstration in support of Bidzina Ivanishvili on 27th May 2011 in Freedom Square and Roustaveli Avenue in Tbilisi which lead to the death of four people including a policeman. "I don't want Mikheil Saakashvili to be arrested but I am ruling nothing out. The law applies to everyone," stressed Bidzina Ivanishvili at the end of June earlier this year. "Occupying a position of responsibility the President of the Republic took decisions. He pretended to be liberal but in reality he controlled all of the media, threatened families, tortured prisoners, killed people in the street; in the business world he controlled all sectors of the economy," indicated the Prime Minister. The former head of government (2012) and former Interior Minister (2004-2012) Vano Merashvili (ENM) was arrested on 21st May last along with Zurab Tchiaberashvili, governor of Kakheti, a region that lies to the east of the country. He is suspected of abuse of power and of having embezzled 5.2 million $ from the State to fund ENM's electoral campaign, for having created fictitious jobs for his party's supporters and for having illegally taken over a villa in the village of Kviriati, that lies on the Black Sea in Adjaria and finally of being involved in the murder of Sandro Girgvliani, an employee of the United Bank on 28th January 2006. In addition to this former Defence Minister (2006-2008) Davit Kezerachvili was arrested in France on 16th October last. "It is not the end but the beginning of a return," said outgoing President of the Republic Mikheil Saakashvili to his supporters. He hopes to remain active in politics. "We have done a great deal over the last ten years to turn Georgia into a successful, modern European country, which is developing rapidly in the international arena. It is our main legacy," he said. He called on his supporters to "respect the opinion of the majority" stressing that the result of the presidential election was a "serious turning point" towards modernisation. He foresees that his country will "experience a zone of turbulence." "No one can ban me or make me stay in the country. But I have no intention of leaving Georgia," declared Mikheil Saakachvili. Aged 44 Giorgi Margvelashvili is a philosophy graduate from the State University of Tbilisi. He worked at the NDI and then at the Georgian Institute for Public Affairs (GIPA) and at the American-Georgian University of which he became the rector (2000-2006 then 2010-2012), as well a director of the research department (2006-2010). He entered politics in 2003. As of 2012 he criticized Mikheil Saakashvili's policies and supported the coalition Georgian Dream-Democratic Georgia led by Bidzina Ivanishvili. He was appointed Education and Science Minister after the general elections on October 1st 2012. On 11th May last Giorgi Margvelashvili was appointed candidate in the presidential election for Georgian Dream-Democratic Georgia. He has promised to improve Tbilisi's relations with the West and Russia - with whom Georgia has had no diplomatic relations since the war of August 2008 over the control of South Ossetia. "Parallel to the priority of Euro-Atlantic integration we must take the heat out of our relations with Moscow," he declared. The future president will live at 25, Atoneli Street, Tbilisi, in a building that was formerly the HQ of the American Embassy.